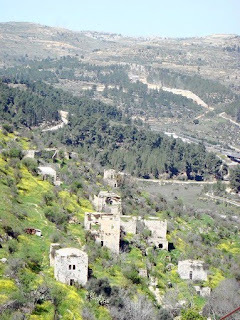 Today's Los Angeles Times has a piece entitled "Israel and Palestinians have conflicting visions for village's future," which describes recent efforts to build "212 luxury apartments, a hotel and retail shops" over the remnants of Lifta, the "last intact pre-1948 Palestinian town in Israel," which has been abandoned since 1948. The story, written by Edmund Sanders, speaks of the Nakba in historical terms (and even uses the word Nakba), not as some debatable or disputed occurrence. He writes of "mass displacement," confiscated land, and the "hundreds of similar Palestinian communities [that] were razed after residents fled during Israel's 1948 war for independence." "During the creation of Israel and the subsequent attack by neighboring Arab nations, 700,000 Palestinians became refugees when they fled the fighting or were chased from their homes by Jewish militias that prevented them from returning. Some Israelis say Palestinians left voluntarily and therefore gave up rights to their land. "Today those towns exist only as dots on Palestinian maps and in the stories of aging refugees. Though many mosques were preserved, most of the homes, shops and roads were torn down to build Jewish cities. Other villages were turned into forests and parks, which explains why hikers sometimes stumble upon what appear to be abandoned mosques in the middle of nowhere." He writes of Palestinian fears that "much of the last surviving evidence that Palestinians once occupied much of what is now Israel." He writes of the Israeli government seizing legal titles to Palestinians homes "under an absentee landownership law passed in the 1950s." He writes of the terror campaigns of the "Jewish militias Haganah and the Stern Gang." He references Ilan Pappe. Even more amazing, perhaps, is his distillation of what he terms "one of the most intractable issues in Mideast peace talks," namely, "whether Palestinians should have the right to return to ancestral homes inside Israel and what this would mean for Israel's survival as a Jewish state." Just that one sentence lays bare how offensive Zionism actually is, how dismissive of the indigenous population it is, how ethnosupremacist it is, and how clearly unjust it is. He quotes an Israeli professor who says, "In the minds of some Israelis, acknowledging the Palestinians' loss competes with their own struggle for statehood." And he ends the piece by giving the last word to a 71 year old Palestinian refugee, who was born in Lifta and was forced to flee when he was 8. "This isn't about stealing a house or land," he says. "It's about stealing a life and memories." In the media battle between truth (usually OpEds written by people like George Bisharat, Ali Abunimah, Ahmed Moor and Jonathan Ben Artzi) and propaganda (Ethan Bronner, Thomas Friedman, everything else), articles like this in the mainstream American press - especially one written by the LA Times' Jerusalem correspondent - are far more threatening to the champions of Zionism's historical revisionism, its eternal victimization narrative, its aggressive ethnic cleansing and its institutionalized apartheid than any debate over the Goldstone Report. Interestingly, if read in tandem with this new piece by Ramzy Baroud in the Jordan Times, one can see just how vital the issue of the Zionist war against Palestinian memory actually is. Baroud, whose article focuses on the new Nakba Law which criminalizes commemoration of the tragic displacement of a native population from their own land in order to make room for a European settler-colonial enterprise, notes "Israel's historical fear of Palestinian memory." Similarly, a recent piece in The Electronic Intifada quotes Haneen Zoabi, Knesset member of the Balad party, as saying, "This is a kind of law to control our memory, to control our collective memory. It’s a very stupid law which punishes our feelings. It seems that the history of the victim is threatening the Zionist state." The LA Times article seems to bridge a once impassable divide between the justice community and the mainstream media, a huge step toward real progress if the narrative of truth is to prevail. This article was originally posted on Mondoweiss. "Palestinian fears that "much of the last surviving evidence that Palestinians once occupied much of what is now Israel." There is no such lack of evidence and there will be no such lack for the next 1400 years (the time frame that Arabs have occupied Judea, Samaria, and Israel. Seems like good old fashion fear-mongering propaganda. Whoa, what happens after 1400 years?